Not to be confused with Haines Mission. As of the 2010 census, the population of the Haines CDP was 1,713,  out of a total 2,508 in Haines Borough. The area around present-day Haines was called Dtehshuh or "end of the trail" by the Chilkat group of Tlingit. It received this name because they could portage (carry) their canoes from the trail they used to trade with the interior, which began at the outlet of the Chilkat River, to Dtehshuh and save 20 miles (32 km) of rowing around the Chilkat Peninsula. The sudden importance of the region increased the urgency of fixing an exact boundary. There were reports that Canadian citizens were harassed by the U.S. as a deterrent to making any land claims. In 1898 the national governments agreed on a compromise, but the government of British Columbia rejected it. U.S. President McKinley proposed a permanent lease of a port near Haines, but Canada rejected that compromise. The economy continued to grow and diversify. Four canneries were constructed around the mission by 1900. However, the completion of the White Pass and Yukon Route railway in neighboring Skagway that same year led to the Dalton Trail's eventual abandonment and Haines' economic decline. In 1903, the Hay-Herbert Treaty entrusted the border decision to arbitration by a mixed tribunal of six members, three American and three Canadian–British, who determined in favor of the United States, resulting in the present-day border. Fort William H. Seward, a United States Army installation, was constructed south of Haines and completed by 1904, on property donated by the mission from its holdings. In 1922, the fort was renamed Chilkoot Barracks. It was the only United States Army post in Alaska before World War II. [ citation needed] During World War II, it was used as a supply point for some U.S. Army activities in Alaska. The fort was deactivated in 1946 and sold as surplus property to a group of investors (Ted Gregg, Carl Heinmiller, Marty Cordes, Clarence Mattson, and Steve Homer) who called it "Port Chilkoot", thus forming the Port Chilkoot Company. Port Chilkoot was incorporated as a city in 1956. In 1970, Port Chilkoot merged with Haines into one municipality. Heinmiller was Port Chilkoot's mayor for the majority of its existence as a separate city. In 1972, the fort was designated a National Historic Landmark and the name, Fort William H. Seward, was restored. Forest next to Davidson Glacier, near Haines. The Haines CDP is located in the north-central part of Haines Borough at 59°14′02″N 135°26′49″W﻿ / ﻿59.233800°N 135.447009°W﻿ / 59.233800; -135.447009. The CDP is situated on the Chilkat Peninsula at a narrow spot called the Deshu Isthmus. The community is bounded by Portage Cove of Chilkoot Inlet to the east and by the Chilkat River at its mouth into the Chilkat Inlet to the west. To the south, down the Chilkat Peninsula, Haines is bordered by the CDP of Mud Bay, and to the north it is bordered by the Lutak CDP. Alaska Route 7, the Haines Highway, terminates at Haines and leads northwest 39 miles (63 km) to the Canadian border near Pleasant Camp, British Columbia. The Haines Highway continues north to a junction with the Alaska Highway at Haines Junction, Yukon, 147 miles (237 km) from Haines. Because of its location in the Alaska Panhandle, Haines has a hemiboreal continental ( Köppen Dfb) climate, with Oceanic characteristics. Winters are mild by Alaskan standards, with an average January high temperature around 30 °F (−1 °C), and the average low around 20 °F (−7 °C). Summers are cool to mild, with an average July high temperature of 65 °F (18 °C), and an average low temperature of 51 °F (11 °C). Various days in the summer surpass 77 °F (25 °C). The highest recorded temperature in Haines is 98 °F (37 °C) on July 31, 1976. The record low temperature in the city is −18 °F (−28 °C) on January 3, 1998. Haines first appeared on the 1900 U.S. Census as an unincorporated village. It formally incorporated in 1910. It disincorporated in 2002 and became a census-designated place (CDP). As of the census  of 2000,[ needs update] there were 1,811 people, 752 households, and 505 families residing in the city. The population density was 134.0 people per square mile (51.7/km²). There were 895 housing units at an average density of 66.2 per square mile (25.6/km²). The racial makeup of the city was 79.62% White, 13.86% Native American, 0.66% Asian, 0.17% Black or African American, 0.11% Pacific Islander, 0.44% from other races, and 5.14% from two or more races. 1.55% of the population were Hispanic or Latino of any race. There were 752 households out of which 33.4% had children under the age of 18 living with them, 53.9% were married couples living together, 8.9% had a female householder with no husband present, and 32.8% were non-families. 27.5% of all households were made up of individuals and 8.2% had someone living alone who was 65 years of age or older. The average household size was 2.40 and the average family size was 2.94. In the city the age distribution of the population shows 26.7% under the age of 18, 5.3% from 18 to 24, 28.0% from 25 to 44, 28.4% from 45 to 64, and 11.6% who were 65 years of age or older. The median age was 40 years. For every 100 females age 18 and over, there were 99.7 males. The median income for a household in the city was $39,926, and the median income for a family was $51,316. Males had a median income of $41,103 versus $30,278 for females. The per capita income for the city was $22,505. About 5.8% of families and 7.9% of the population were below the poverty line, including 9.2% of those under age 18 and 2.4% of those age 65 or over. 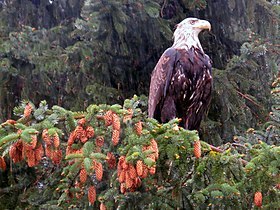 Many tourists visit during the annual appearance of bald eagles in the Alaska Chilkat Bald Eagle Preserve between October and February. During this time, Haines has the largest concentration of bald eagles in the world. In May, Haines holds Alaska's longest running beer festival, with over 1,500 visitor and breweries from Alaska and Yukon. Haines is the host of the Southeast Alaska State Fair, with four days of festivities on the last weekend of July. Vendors, games, rides, and a music festival bring people from all over Alaska for this event. The community and surrounding area are popular for outdoor recreation. Rafting in the Chilkat River and hiking in the Takshanuk Mountains ( Mount Ripinsky and other peaks) are both popular. Growing winter recreational opportunities are available at and around Chilkat Pass, for which Haines serves as a gateway with the Haines Highway. In recent years, Haines has received increasing attention as a site for heli-skiing. The Davidson Glacier, due to its relatively accessible nature, is also a popular attraction. Lutak Inlet and Chilkoot Lake are easily accessible and popular fishing sites. Lutak Inlet is frequented by numerous sea lions, seals, and orcas. Fort William H. Seward is a nationally recognized historic site (declared a National Historic Landmark in 1978), where a number of barracks, officer housing, and parade grounds are maintained, in private ownership today. Some of these structures are open to the public as businesses and restaurants. The fort is also referred to as "Port Chilkoot", a leftover from the Port Chilkoot Company, which was formed after World War II by a group of investors who purchased the fort from the federal government. Haines has a number of cultural offerings. Alaska Indian Arts  offers demonstrations by traditional craftsmen. History of the town of Haines and the local Tlingit people are featured in the Sheldon Museum & Cultural Center. The Hammer Museum  is dedicated to the history of the hammer in human society. The Tsirku Canning Company Museum offers a glimpse of Haines' historic salmon canneries. Tourists also visit annually on cruise ships. Port of the commercial ferry in Haines. 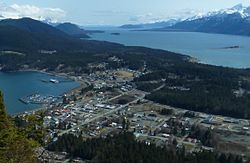 Haines is more accessible than most other southeast Alaskan communities of its size, as it is connected to the North American highway system by the Haines Highway, which passes through British Columbia on its way to the junction with the Alaska Highway at Haines Junction, Yukon. However, snow and ice conditions in the winter and the long driving times can often make this route less feasible, and at times results in closure of the portion of the highway in the Chilkat Pass, just north of the Canada–US border. Haines is one of only three cities in southeast Alaska which are accessible by road to another city, the other two being Skagway and Hyder. The primary mode of intra-Alaskan transportation is by the Alaska Marine Highway. The Lynn Canal route of the ferry system ( Juneau-Haines- Skagway) is the only profitable route in the entire system[ citation needed] and often receives a large amount of ferry traffic, especially in the summer. The Haines Airport receives a large amount of traffic, with three bush carriers ( Alaska Seaplanes, Wings of Alaska and Harris Aircraft Services) providing services to Gustavus, Skagway, Sitka, and Juneau. Recently, Haines became a port-of-call to several cruise ship operators, including Princess Cruises and the Holland-America Line. As of summer 2009, the cruise ship visiting frequency is about 18 per season, according to local residents. [ citation needed] Between 2010 and 2012, an average of 30,000 cruise ship passengers visited annually . The cruise ship berth is very near Fort William H. Seward. Haines is served by Haines Health Center, the only primary health clinic in the area. The facility is part of the Southeast Alaska Regional Health Consortium, or SEARHC, a non-profit tribal health consortium of 18 Native communities. The center is open daily Monday through Friday year round, and also provides urgent care after hours. The area is also served 24/7 by local EMS. Individuals in need of dire medical attention are transported by air via helicopter or air ambulance to Bartlett Regional Hospital in Juneau (approximately 35 min by plane). Whitehorse General Hospital in Whitehorse, Yukon is the nearest hospital to Haines that is accessible by road (approximately 4.5 h away). The difficulties in accessing health care for rural dwellers in general were examined in a short black-and-white documentary set and filmed in and around Haines in the 1940s, documenting and dramatizing a stop on the travels of a public health nurse and doctor (both female) aboard a travelling clinic boat, "Hygiene." According to the voice over, the film was cast with local non-actors, but many of the scenes were dramatized and appear to have been staged. Haines is served by a weekly newspaper, the Chilkat Valley News,  as well as the public radio station KHNS which serves upper Lynn Canal (Haines, Skagway, and Klukwan) although its primary studios are located in Haines. Haines also receives circulation of the free regional newspaper Capital City Weekly. ^ 2015 Alaska Municipal Officials Directory. Juneau: Alaska Municipal League. 2015. p. 7. ^ "Skagway - Forest Service" (PDF). USDA. Retrieved 2018-05-18. ^ a b "Geographic Identifiers: 2010 Demographic Profile Data (G001): Haines CDP, Alaska". American Factfinder. U.S. Census Bureau. Retrieved April 14, 2017. ^ "Anchorage breaks seasonal snowfall record". CNN. April 8, 2012. Retrieved 2012-04-09. Other record-setters in the state include Haines, a community about 92 miles north of Juneau that saw about 360 inches of snow for the 2011-2012 season -- smashing the previous record of 309 inches set five years ago, according to the weather service. ^ "HAINES, ALASKA (503490)". Western Regional Climate Centre. Retrieved 25 August 2016. ^ Northern Economics, Inc. (December 2012). "Port of Haines: Potential for Development" (PDF). 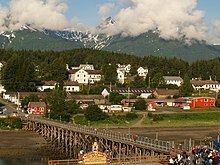 Wikimedia Commons has media related to Haines, Alaska.